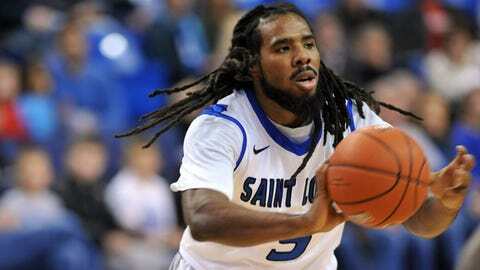 Jordair Jett provided his usual stellar defense against ISU to go along with 12 points and a game-high seven assists. ST. LOUIS — Dwayne Evans scored a season-high 24 points and Rob Loe added 15 with nine rebounds as Saint Louis defeated Indiana State 83-66 Wednesday night. The Billikens (10-2) had an early 11-point lead in the first half, but Indiana State countered with a 15-4 run to tie the game. Saint Louis closed on a 7-0 stretch capped off by a 3-pointer from Loe to grab a 34-27 halftime advantage. Indiana State (7-3) was within five at the 12:40 mark in the second half, but Saint Louis surged away with a 21-10 run and led by 19 with 2:08 remaining. Saint Louis, whose only defeats have come in narrow losses to ranked opponents Wisconsin and Wichita State, had an almost identical shooting percentage to the Sycamores, but made seven more 3-pointers. Austin McBroom had 15 points and Jordair Jett contributed 12 with seven assists. Manny Arop led Indiana State with 16 points.